A Color Proof (Contract Proof) is an ISO certified test equipment for the graphics industry. A color proof simulates the color of offset printing or gravure printing color accurate binding within the tight tolerances of ISO 12647-7. Today, a proof is processed via a RIP and then produced with pigment inkjet printers on special proofing papers. The proof data is converted to color separations, then reassembled into a composite image to simulate overprinting and trapping correctly. The data is then passed as a composite image to a usually more than 8-color inkjet printer, which prints the data. In addition to the proof data, a digital proof must carry a Mediawedge by UGRA / FOGRA or IDEAlliance to be legally binding. Thanks to the standardized mediawedge, the print shop is able to check the proof for correctness. Since many printers don’t have the neccessary metrology at hand, digital proofs are often directly provided with a test report, which documents the accuracy of the measured values ​​of the media wedge directly on the proof. Older proofing methods as chromalin or Kodak Approval etc. are today hardly any more found in the market. In addition to the term “digital proof” even terms like color proofing, proofing or online proofing are common. In the ISO 12647 “Contact Proofs” (ISO 12647-7) are the highest standard of proofs, but the term “Validation Prints” (ISO 12647-8) is also defined. A “Validation Print” is distinguished in that it is less accurate in color, but therefore can also be produced on laser printers. Compared to the contract proof, a Validation Print has higher color variations and is NOT automatically legally binding – only after prior consultation. A real “proof”, ie a real contract proof according to ISO 12647-7 is currently not only the most color accurate and best option, but also the only legally binding proof. 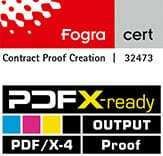 A Digital Proof (Contract Proof) is an ISO certified test equipment for the graphics industry. A digital proof simulates the color of offset printing or gravure printing color accurate binding within the tight tolerances of ISO 12647-7. Today, a digital proof is processed via a RIP and then produced with pigment inkjet printers on special proofing papers. Ein Kontrakt Proof (engl. : Contract Proof) ist ein farbverbindlicher und rechtsverbindlicher Proof nach ISO 12647-7. Der Kontrakt Proof ist der derzeit höchste Proof Standard mit den engsten Toleranzen und gilt daher als “Kontrakt”, also als Vertrag zwischen dem Proofersteller und der Druckerei. Die Qualität und Leistungsfähigkeit eines Proofsystemes kann z.B. von der Fogra durch das Zertifikat “Contract Proof Creation” überprüft und erteilt werden. Unternehmen, die für die Erstellung von Kontrakt Proofs durch die Fogra zertifiziert sind, dürften das FograCert Logo führen. Anhand der Zertifizierungsnummer kann auf der Website der Fogra einfach nachgeprüft werden, für welchen Proof Standard das Zertifikat erteilt wurde und ob es gültig ist. Da das Zertifikat mit hohen Kosten verbunden ist und nach nur einem Jahr abläuft und rezertifiziert werden muss, scheuen zahlreiche Unternehmen die Kosten und werben leider mit viele Jahre alten Zertifikaten.